Haq's Musings: Will Pakistan Test Obama? "Mark my words. It will not be six months before the world tests Barack Obama like they did John Kennedy. 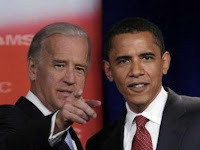 The world is looking," said Barack H. Obama's running mate Joseph Biden last Sunday in Seattle, Washington. "Remember I said it standing here. if you don't remember anything else I said. Watch, we're gonna have an international crisis, a generated crisis, to test the mettle of this guy. And he's gonna have to make some really tough -- I don't know what the decision's gonna be, but I promise you it will occur. As a student of history and having served with seven presidents, I guarantee you it's gonna happen," Biden continued. Biden is often described as a "gaffe" machine. So, it is not strange to see that it is Joe Biden, of all people, who "promised" the world of an "international crisis" that will "test the mettle" of his young running mate within six months. What a gift to the McCain campaign at this moment when Obama is enjoying double digit lead over McCain. As expected McCain campaign jumped on it. "The next president won't have time to get used to the office. We face many challenges here at home and many enemies abroad in this dangerous world," John McCain said. "We don't want a president who invites 'testing' from the world at a time when our economy is in crisis and Americans are already fighting two wars." McCain said it was even "more troubling" that Biden suggested supporters stick by Obama if the actions he takes are wrong or unpopular. "Senator Obama won't have the right response, and we know that because we've seen the wrong response from him over and over during this campaign," he said. While Biden did not elaborate on the likely scenarios that will test Obama, McCain's running mate Sarah Palin thinks Obama's Pakistan stance and the potential international crisis there that could be one of the test scenarios for Obama. Other crisis scenarios for young Obama include situations in Iran, Georgia, Iraq and Joe Biden's mouth! He told Democrat donors to mark his words – that there were “at least four or five scenarios” that would place our country at risk in an Obama administration. Thanks for the warning, Joe! He didn’t specify what all those four or five scenarios will be, but for clues, let’s review the Obama foreign policy agenda. Our opponent wants to sit down with the world’s worst dictators. With no preconditions, he proposes to meet with a regime in Teheran that vows to “wipe Israel off the map.” Let’s call that crisis scenario number one. Senator Obama has also advocated sending our U.S. military into Pakistan without the approval of the Pakistani government. Invading the sovereign territory of a troubled partner in the war against terrorism. We’ll call that scenario number two. He opposed the surge strategy that has finally brought victory in Iraq within sight. He’s voted to cut off funding for our troops, leaving our young men and women at grave risk. He wants to pull out, leaving some 25 million Iraqis at the mercy of Iranian-supported Shiite extremists and al Qaeda in Iraq. By his own admission, this could mean our troops would have to go back to Iraq. Crisis scenario number three. After the Russian army invaded the nation of Georgia, Senator Obama’s reaction was one of indecision and moral equivalence – the kind of response that would only encourage Vladimir Putin to invade Ukraine next. That would be crisis scenario number four. But I guess the looming crisis that most worries the Obama campaign right now is Joe Biden’s next speaking engagement. Let’s call that crisis scenario number five. The same Joe Biden said he would be honored to run on the ticket with John McCain because, quote, “the country would be better off.” And here we have some common ground. I want a president who spent 22 years in uniform defending our country. I want a president who isn’t afraid to use the word “victory” when he talks about the wars we are fighting. I want a president who’s ready on Day One. I want a president with the experience and the judgment and the wisdom to meet the next international crisis – or better yet to avoid it. I want John McCain as our commander-in-chief. I believe there will be massive challenges on diplomatic, economic and national security fronts regardless of who is elected to the While House this November. The new president will not have much of a honeymoon period. If the new president does not hit the ground running, no amount of expert advice will suffice. The new president will require both judgment and experience to respond quickly to potential crises. couldn't get worse? a long protracted war fighting on two fronts with two enemies, one of which was an allie and the other their own country men. i can imagine it getting a whole lot worse. also his statement is being blown out of proportion he said he would go into Pakistan only if there's evidence of bin laden hiding in one of those caves. i don't think Obama will be fooled by the kind of intelligence that got us into the Iraq war.